The U.S. Economy is broken. Long-term economic growth is fluctuating on average between two and three percent which ranks this as perhaps the worst economy since W.W. II excluding major recessions. Decades of adherence to “supply-side” economics (translation: tax cuts for the rich) is mainly to blame. In addition, advances in information technology, globalization, the decline of unions, and the government’s virtual abandonment of worker protections, have caused wage stagnation which , in turn, has led to lackluster demand and slower overall growth. So how do we fix it? Well, we should do the exact opposite of what has been done for decades since the 1980’s. Rather than cutting taxes, we should be investing to grow the economy. The technical name is “demand-side” or “Keynesian” economic theory. In effect, the Progressive wing of the Democratic Party is having a long overdue conversation about failed economic policies and what is really needed going forward to distribute economic benefits more equitably to all Americans and grow the economy through increased demand. How do you pay for it? 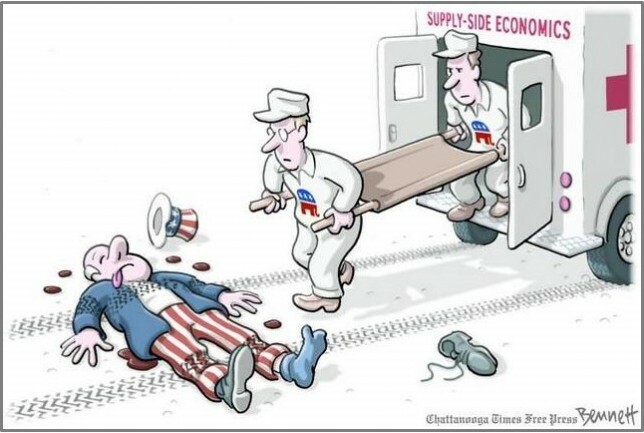 Thanks in large part to long-standing adherence to “supply-side” economics since the 1980’s and resulting tax cuts, we now have a hugely regressive system where wealthy individuals, who derive a significant portion of their income from dividends and capital gains, pay less in taxes as a percentage of income than average working men and woman. And if that isn’t bad enough, our tax code is riddled with loopholes that corporations and other wealthy individuals and businesses often use to avoid taxes altogether. It needs to be fixed – and that is what Democrats are getting at when they talk about raising taxes on the wealthy: It is really about making our tax system fairer and more progressive so we have the resources needed to invest for the future, stimulate economic growth and reduce income inequality. And so those who have benefited the most, pay taxes in proportion to the benefits they’ve received. Radical ideas? Hardly. They worked in the aftermath of W.W. II, one of the greatest periods of overall economic and wage growth in American history. And they can work again. Let’s start by at least having the conversation and not demonize as “radicals” and “socialists” those who dare to talk about important economic issues affecting the lives (and livelihoods) of everyday Americans. And let’s admit that there will be compromise along the way. Let’s keep talking, respectfully, to each other. Let’s not be distracted by those, including much of the mainstream media, who want to turn everything into a conflict, a virtual war of opposing ideas and ideals. And when we are done talking, let’s try to actually get something done, because the economy (and our political system) is broken and change is long overdue.